Join the discussion on our forums! Come discuss Safeguard over in our dedicated Safeguard discussion topic. 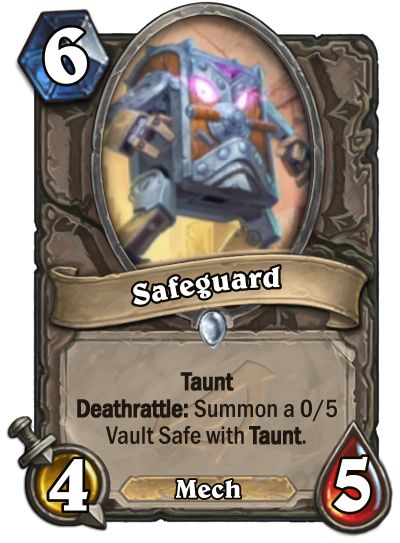 would it really prefer it to have six health, but its good regardless. Great in Mech hunter for it provides some well-needed protection in a class that has no healing spells or armor gaining spells. I hear him say: "Save the magic world!" Now with this in the game, I think that Animated Shield should be a mech. Has anyone tried this card in a deck w/o mech support, and if so, how does it fare by itself in that regard? It strikes me as a curious mix between Sludge Belcher and Sunwalker, I'm curious to try it but it feels a bit slow too on paper for it's purpose. The token almost certainly survive a turn, so you can magnet Beryllium Nullifier on it and wreck all aggression. That vault safe is a 0/5. Mostly useless. Unless you have buffs, this isn't that great. You know what else seems useless when you look at it in a vacuum? 1/2 slimes with taunt. You're not looking at the bigger picture. Yes, it costs 6 and the stats neither the minion nor the token are that great for a 6 cost. But at the very, unless it is silence (and almost any taunt minion can be silenced), it will take you opponent two attackers, two spells, or a mix of both to get through this minion. If your opponent is limited at both in late game, then this could be a hard minion to deal with. Plus, just like someone else pointed, this is a relative minion type (it is a mech so it can be magnetized).